Is your CEO a TFW? 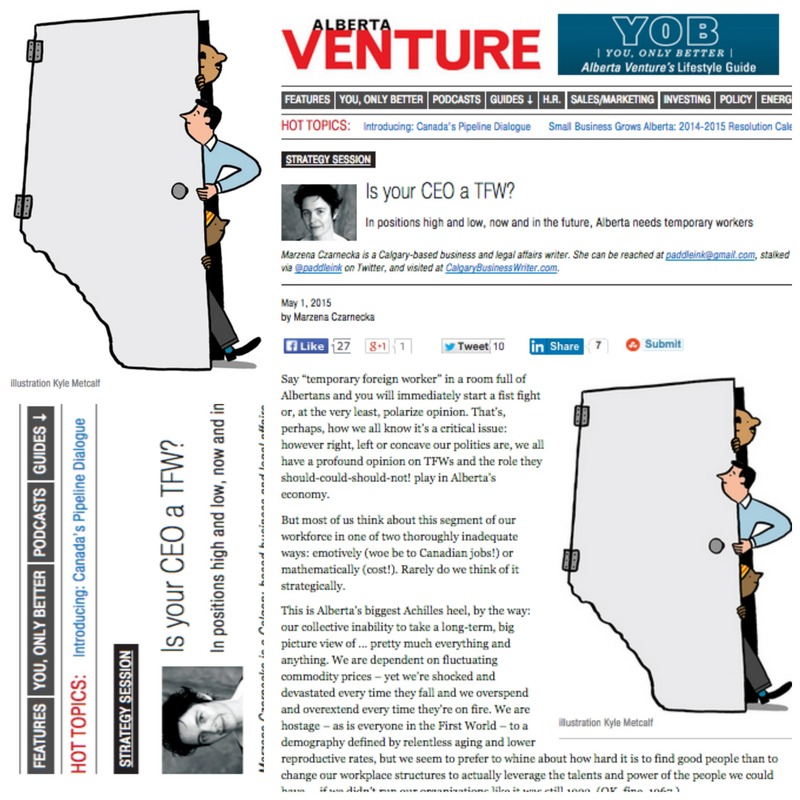 Full edited text available at Alberta Venture: Is Your CEO A TFW? Say “temporary foreign worker” in a room full of Albertans and you will immediately start a fist fight—at the very least, polarize opinion. That’s, perhaps, how we all know it’s a critical issue: however right, left or concave our politics are, we all have a profound opinion on TFWs and the role they should-could-should-not! play in Alberta’s economy. But most of us think about this segment of our workforce in one of two thoroughly inadequate ways: emotively (woe be to Canadian jobs!) or mathematically (cost!). Rarely—strategically. The current-continuing focus on TFWs presents a great opportunity to reflect what role a global workforce should-could-should-not play in each individual business’—and our entire province’s—long-term plans. The challenges of the existing federal program, the alleged abuses of the program by employers, our responsibility as individual employers and as a society to people we encourage to uproot and live in a state of uncertainty for the benefit of our economy, the impact of how we embrace or eschew this responsibility on our present and future well-being—so much to talk about. That goes for low-skill TFWs and high-skill, high-salary TFWs alike. And this is an aspect of Alberta’s reliance on global talent that doesn’t get discussed often enough in this debate—perhaps because one can’t spin an emotive exploitation narrative around UK-sourced CEOs earning six-figure salaries. But that talent is as critical to Alberta’s economic well-being as the manpower at the bottom. They both need to be part of a long-term human resources/workforce strategy. One that makes sense over years and is responsive over decades—not one determined from quarter to quarter, depending on what costs must be cut from a badly managed balance sheet. Let’s take that German biotech god with three PhDs. Also, he’s got an MBA from Harvard, I understand—that was the icing. The position he’s in took you, what, a year to fill? The cost involved in these searches is astronomical: the recruiter’s fee (which is generally equivalent to a year’s or so of the recruit’s salary) is just the beginning. The disruptive influence on the company or its unit inherent in a change of leadership and management, the learning curve required… all of that’s a cost. So when you’ve made that investment in a leader—or technical expert—does it make any sense to consider her as, first and foremost, a cost on your books when commodity prices, stocks and growth take a dip? Of course not. You do whatever you can to get return on that investment. You think creatively, strategically—over the long term. You know that if you let her go now—she sure as hell isn’t going to consider coming back to you eighteen months from now when you’re screaming for her expertise again. Do you think about your low-skill TFWs the same way? No? Why not? Because the per person investment isn’t as high? It will take you about three months to process a new Labour Market Impact Assessment when you realize, a quarter or two or three in, that you need your TFWs again. You’ll have to disclose that you’ve engaged in lay-offs—and that might impact your ability to get those positions back. You’ll have to engage in processing, travel and training costs, again. We’re going to see in the media that after laying off your TFWs—and Canadians—in droves last year—you’re now whining about a labour shortage. That’s bad optics, baby, and bad optics is bad business. When the economy turns—and we’ve got two more big booms in us, loves, before the massive crash that shatters us completely, unless we change our short-sighted ways, comes—it will turn on a dime. And you’re going to need all the TFWs, and more (and Canadians and permanent residents), to perform at the speed then demanded. Ackah sees many of her clients addressing this challenge proactively. “They’re looking at job sharing, sabbaticals, moving people to different projects—everything and anything to keep institutional knowledge within the organization and to be ready for future needs,” she says. They’re also implementing processes that move their non-Canadian employees onto the permanent resident immigration track faster—both a compassionate act and a good business decision, Ackah says. A PR has the ability to look for other work should a lay-off be necessary—a TFW doesn’t. A PR who remains permanently (ok, we know there’ s no such thing: long-term, let’s say long-term) with a company requires much less paperwork and processing. She also sees the most forward-thinking companies use the time to reflect, hard, on their long-term needs. This is the time to look at shedding not the last-on-board, most expensive person—but the lowest performer, the redundant position, the person who got hired “because you needed bodies.” Now you don’t—it’s ok to shed them—I’m not telling you to never, ever. Just don’t be short-sighted about it. Speaking of short-sighted… your low-skill TFWs. Training. Upskilling. For the love of Toth, Hermes and Odin, wrap your head around the fact that training people isn’t something you do for them—it’s a thoroughly selfish corporate act, from which they happen to benefit—but you do it for you first. Trained people work better. And yeah, have a better chance to land on their feet if you need to let them go—but first, they’re more productive for you. You’re gonna train your South African-born project manager. Do the same for the vulnerable on the other end. Make this practice part of your long-term global workforce strategy. Because the future has this nasty habit of happening whether you’re ready for it or not.